Chevron Eco Lodge in Kausani is the hotel which seeks to sustain itself by eco-friendly means and thus has solar powered lights. 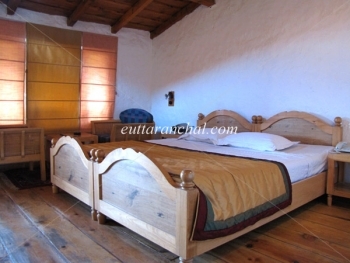 Built like a Machan, it is modeled on the lines of a typical Kumaoni house in villages, using only stone and wood. The Eco Lodge resort gives you a taste of the rural lifestyle - its very quaint and beautiful. Add to this the panorama of the Himalayan snow peaks spreading in front of you, and you will be charmed. The view from the Eco lodge resort is breathtaking - all 300 km run of the snow peaks of the Himalayas in a 180-degree frame, spreading beyond green valleys and mountains. 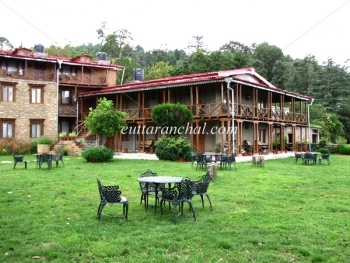 Chevron Eco Lodge is located near the View point and is 2 Kms from the Kausani bus stand. There are 8 Double bedrooms here and 2 Duplexes available at Chevron Eco Lodge. The Duplexes are built in a deliberately rough fashion, evoking a typical village house. The walls have a mud-plaster effect and the electric switches are the lumbering, black ones not seen anymore. The flooring is wooden and resounds under your feet. The restaurant in Chevrons Eco Lodge Resort is primarily open air, shaped like an amphitheatre with a shed in one corner. The roof is gabled and like in so many houses on the mountains, the doors are painted dark blue with a thick coat of varnish. Bookshelves line the walls and the edges have jute lamps hanging from the ceiling. Outside seating is shaded by a large walnut tree around which copper pots and pans scattered around. The centre of the amphitheatre courtyard has a bon fire. The restaurant serves a multi cuisine fare. None of the above room tariffs and packages of Chevron Eco Lodge in Kausani, are applicable during Christmas and New Year Period. The Chevron Eco Lodge Resort is 180 km away from Pantnagar Airport. The nearest railhead is Kathgodam Railway Station, which is 145 km away. The nearest Bus station is in Kausani and it is 2 km away. The Chevron Ecolodge hotel is situated 405 Kms from Delhi, 75 Kms from Ranikhet, 53 Kms from Almora, 115 Kms from Nainital, 150 Kms from Corbett National park, 100 Kms from Karnaprayag.